Can I Use Compression Fittings to Install a Shower Fixture? Do I Need to Tape a Plumbing Fitting With a Compression Ring? A showerhead, like other components in your bathroom, does not last forever. Over time, the head begins to leak; sometimes, the head leaks immediately after installation. A leaking showerhead not only wastes water, but causes water to pool in the bottom of your shower or bathtub. The pooling water eventually leads to rust forming around the drain guard. 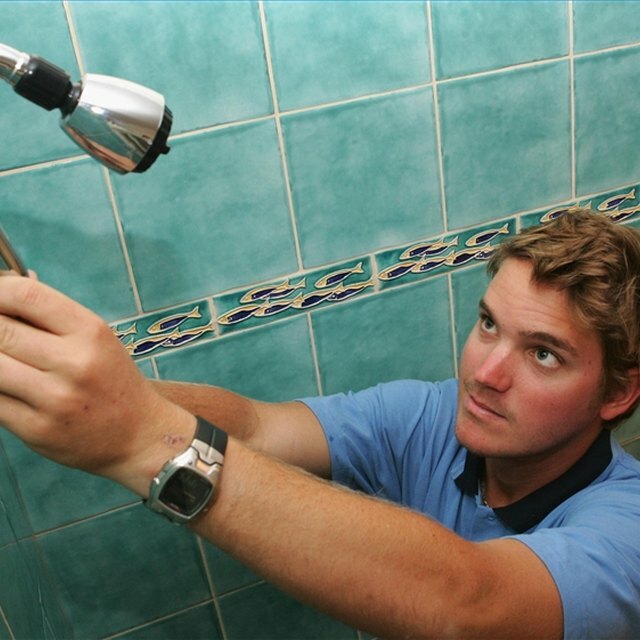 Before repairing your showerhead, you need to know what is causing the part to leak. A worn gasket or old Teflon tape can cause a shower head to leak. The pipe coming from the wall holding the showerhead contains threads that must have a Teflon tape or pipe thread compound coating. The coating forms a seal between the pipe and the showerhead. If the coating is missing, your showerhead will leak at the pipe/showerhead connection. If you only wrap one, small piece of Teflon tape around the pipe leading into the showerhead, or you put the tape around the pipe with the sticky side facing up, your shower head will leak at the pipe/showerhead connection. Over-tightening the showerhead when screwing it onto the pipe also results in a leaking showerhead. This causes water to improperly enter the showerhead and destroys the gasket inside of the head. A showerhead contains a washer, also known as a gasket, inside of the unit that is like a sink's washer. Over time, the washer deteriorates and leads to leaking. If your showerhead is leaking from the head itself--around the head's rim or from a hole on the side of the head--once you have shut off the water, the problem is that one or more of the head's internal components are failing. The shower needs replacing. If the leak is coming from the swivel ball between the showerhead and the connecting pipe, the O-ring close to the swivel ball needs replacing. Mineral deposits and scale buildup also causes leakage. The buildup causes water to escape from both the pipe and swivel ball connections as well as from the shower head itself once the water is off. If the deposits are left to buildup, your showerhead eventually will fail, and water continuously will stream from it.